When Irish hoops fans talk about head coach Mike Brey, his laid-back nature and approachability are common refrains. They often describe him as the coach currently at Notre Dame they’d most like to have a beer with. To my knowledge, ND isn’t about to market a Mike Brey hangout opportunity. 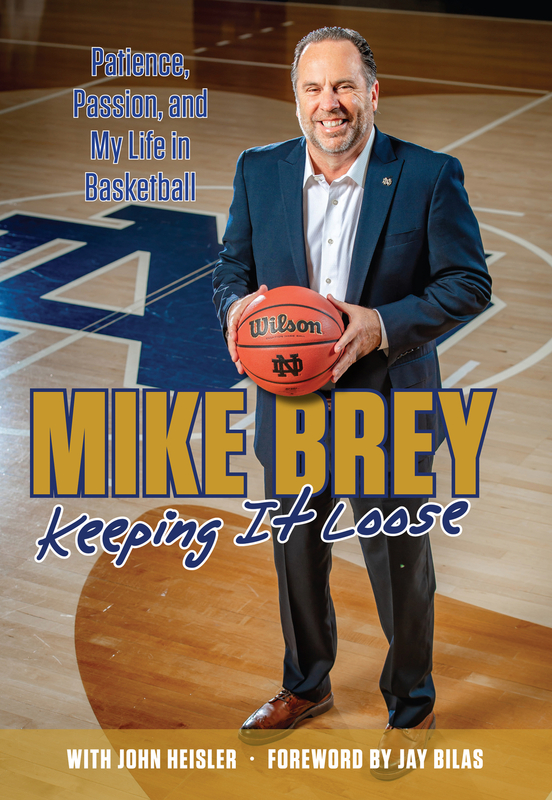 But Triumph Books is giving us the next best thing — a new book co-written by the coach and Senior Associate AD John Heisler, Mike Brey: Keeping it Loose. What job did Brey covet before he got his opportunity at Delaware that may have precluded him from ever become ND’s coach? What job did Brey actually have for 24 hours before he decided it wasn’t for him? Where did Brey first meet Digger Phelps and how did that meeting affect him taking the Notre Dame job? How did John MacLeod help Brey integrate into the Notre Dame family? How does Coach K really feel about Notre Dame? Many people feel a career in broadcasting awaits Brey when his days at Notre Dame are done, and he brings that ability to catch and hold his audience to bear throughout the 267 pages. He shares memories about every player who has ever suited up for him in South Bend, from Troy Murphy and Ryan Humphrey on through to DJ Harvey and Nic Djogo. He talks about getting secure in the Big East and moving over to the ACC, hitting the milestone wins for the Fighting Irish, and the successes and challenges along the way. The Notre Dame basketball fan in your life would love this book. It’s available on Amazon in both Kindle and hard-cover format, along with Apple Books.